The bold, architectural design meets the graceful movement of the creeping second hand and the patented 262 kHz high-frequency movement . Progressive time measurement at the highest level. The Precisionist collection is a complex work of art with an attractive selection of sporty and elegant styles, including chronographs - all with state-of-the-art Precisionist movements. 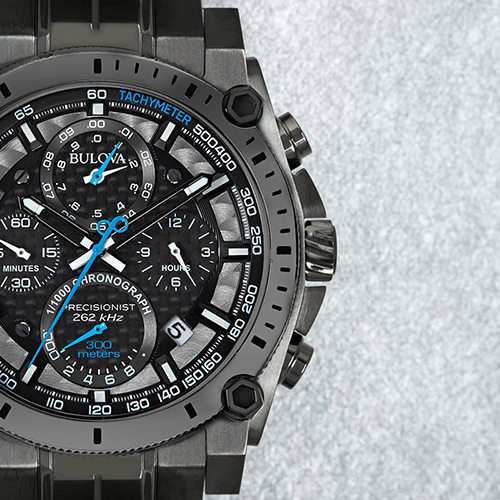 Powered by Bulova's unique Precisionist movement with high performance and creeping second hand that performs 16 movements per second. The oscillation frequency of 262 kHz provides incomparably high accuracy. The chronograph with 4 auxiliary dials allows time measurements with 1/1000th of a second accuracy up to 12 hours. 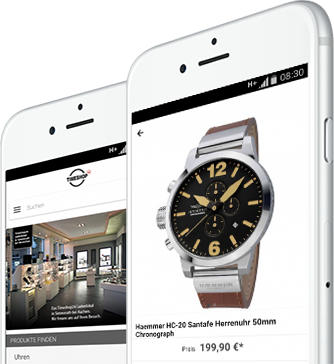 Precisionist-Infinity-Logo and counterweights on the second hands stand for highest accuracy. Use of the finest materials, e.g. hypoallergenic surgical stainless steel 316L for cases, genuine leather wristbands and carbon fiber. Longitudinous screw-retained cases and crowns. Selected models with sapphire glass. Classic design with elaborately designed cases and multi-layered dials, with luminous hands and markings, tachymeters; some with day/date functions. Elegant and sporty men's models up to 100 meters, chronographs up to 300 meters waterproof. No complicated maintenance requirements compared to other high precision watches. To take the time with the chronograph, press push-piece A. 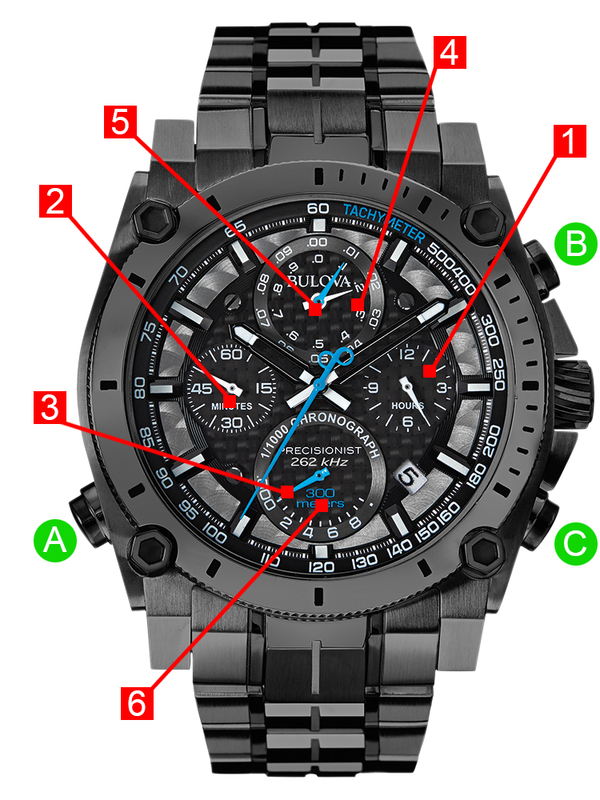 All the chronograph hands move to the zero position. Press push-piece B to start timing. The second, 1/10th and 1/100th second hands move every 30 seconds. To conserve battery power, the 1/10th and 1/100th second hands will stop, and the timing will continue for up to 12 hours. Press push-piece B again to stop timing. All hands of the chronograph return to the zero position. Press push button C to reset the chronograph. Press push-piece A to return to normal timing.